I am reading a new book. The above quote comes directly from author, Marie Levine, who penned that book. It is entitled First You Die: Learn To Live After the Death of Your Child. Ms. Levine experienced the death of her only child and lived through it to write the words that would console, comfort and inspire another grieving mother. Never in my wildest nightmares did I dream that I would ever find the need to read such a book or to find words to sooth my grieving heart. My experience defies what is normal. Parents are not supposed to outlive their children, it simply should not be. But the reality, my reality, is that it happens. But how does one deal with such a tragic situation? Lay down and die yourself? Although there have been many a day when I want to do just that, reality sets in. I have something to do. There’s someone who needs me. There are also so many people to help.I think of others who have experienced loss, and how they used their grief, their pain, their experience to help others in need. One such individual is John Walsh. He lost his son Adam in a very horrific way and one would have thought that he would have given up. Instead, he thought of a way that he could help others in a similar situation. His tireless anti crime activism, his work on the television show America’s Most Wanted,has proven to be a benefit to many. Dangerous criminals have been captured and have taken their proper places in lock up. Mrs. Mamie Till, who mustered up the unbelievable strength and boldness to allow an open casket so that the world could behold what a group of monsters did to her only son. Emett's death was not to be in vain. This courageous mother fought without let up until justice was realized. This true champion of civil rights lived to be 81 years old and endured crushing pain for that long. Mrs.Till is resting peacefully. Another gifted soul that comes to mind is no stranger to many individuals in the world of international adoption. Mrs. Haregewoin Teferra, a hero to many,in the depths of own grief from the loss of her daughter,found the strength to care for countless Ethiopian orphans. She has enhanced the lives of these dear ones as well as inspired others to adopt including this writer. (Me) This is something that she had done until her recent death about a week ago. Mrs. Teferra will be greatly missed. I am sure that if I think long and hard enough I can come up with many more examples. Through all of this I have realized that it is possible to be comforted from the example of others. Many a book has been written, a song sang, a story told that is born out of the anguish of another. King David was in deep distress when he penned many of the Psalms. This is the poetry that is wrenched from deep within that Ms. Levine so eloquently described in the above quote. This poetry becomes a cleansing to the poet and to the recipients of the words. I long to be a poet. I have been waiting one month and one day. I have nothing new to report. I love to try new foods. I love flavorful spices that delight the palate and appeal to the senses. I most especially love Asian and Caribbean fare. Surprisingly to most however, I am not a big fan of hot spices. I don’t want to have to dilute my meal by drinking tons of water to quell the fires in my mouth and stomach. I prefer sweet and savory together. This is so contrary to my Q’s taste. First of all she was a very picky eater from the time she tasted her very first morsel of food up until her last meal. I was told that she was very thoughtful upon choosing that last meal. She did not know that it would be her last, however she was simply true to herself, she did not eat just anything,she had her favorites. Secondly, she enjoyed a fiery dish. She loved hot spicy, food. She would add hot sauce to meals, you know the red kind. I despise the stuff. Q was not big on experimentation with food. She liked simple things and could eat them very regularly and not get bored. I was never a world class cook; however I loved to try a new recipe from time to time. Q was often very hesitant to try my concoctions so I really cooked in vain. She did try her own hand at cooking. She loved to cook Mexican dishes. I, on the other hand, will try almost anything except dishes that have exotic meats. I am being nice when I use the word exotic. What I really want to say is that anything with weird animals or animals of any kind, for that matter, will not pass my lips. I was a strict vegetarian from late teen years up until my pregnancy. I do now on occasion eat poultry and seafood, but only in dishes that I am used to. For new dishes I prefer to choose the vegetarian version. 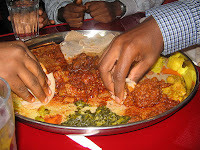 Lately I have been training my palate to enjoy Injera, Shiro Wat, Gomen and other dishes. I must admit that I have grown to appreciate the injera, though I was not immediately in love with it. It is a bit sour for my taste. I do appreciate the texture and nutritional value. Teff has protein and the injera is only one Weight Watcher point. Yesterday I visited one of the more popular Ethiopian restaurants in my area. What I like about Meaza is the atmosphere and the warmth of the staff. The dining area is large and I love the fact that we seat ourselves. I was there one time when entertainment was provided. They had good music and a great singer. I was tempted to show off the Eskesta that my students taught me, but shyness overtook me. The workers are very hospitable. The owner always comes out (at least when I have been there) to greet the diners and to make sure all are satisfied. There was a mistake on our bill that was quickly rectified. Another worker, I am not sure in which capacity she serves, made sure that the mistake was corrected. My friend said that she had slT'an which means authority. This worker remembered me from the last time and that I was learning Amharic. This impressed the two fine Habesha gentlemen at the next table. This restaurant also has a shop attached to it. I had previously purchased some spices, dabo (bread) and a cookbook. I was able to make my version of shiro wat and gomen. It actually came out pretty tasty. I also purchased a type of injera that was mixed with wheat flour so it didn’t taste quite as sour. During my wait I will continue to experiment with foods and cooking. I want my little one to settle in with a sense of familiarity. I have always loved languages and cultures. I took many years of Spanish from Elementary FLES through Spanish literature in college. I took one year of Italian in high school and a college semester of French. In junior high School I even embarked on a self study course in Swahili. Now with all of that academic instruction one would think that I had the gift of multilingual gab or that I would have a functional vocabulary in at least one of these languages. Well despite countless hours of conjugated verbs and rolling tongues, I am the master of none of them. I can count to three in French though. We know the saying, if you don’t use it you lose it. I lost it long ago…Now I can do a great job of faking it as I smile and nod. I do, however, feel most proficient in Spanish, although not at all fluent despite my many years of study. My plan is not to allow all those years of Spanish to go to waste. I have many opportunities to use the language and a review is in order. Spanish is also the language that Q chose to study. She embraced the language and the culture. Another language that I will have the opportunity to use is Amharic. There is a very large Ethiopian population here. Learning Amharic is the order of the day, especially as I prepare to communicate with my little one and my newly acquired friends and family members. 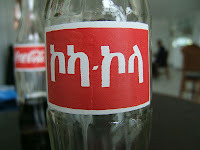 But Amharic is no easy feat. There are over thirty characters and seven forms of each character. It is a very difficult language, though I must admit not impossible to learn. I learned the pattern and I can recognize some of the characters. I had a private tutor for a while but now rely on books, computer software and the kindness of my friends and students. They are so willing to help. I do not know the age of the little one who is waiting for me, but while I wait I want to prepare for her arrival. This includes the study of her language and her culture. This language study will not go to waste as I will communicate with Amharic speakers for a lifetime. When I was pregnant with Q I was a bundle of nerves. I would be responsible for a tiny new life. I guess what frightened me the most was the fact that I, a recent college graduate with no employment prospects, would be raising my child alone. I became a single mother by circumstance. This was frightening, but at the same time, it was my motivation. Knowing that this little one would look to me for everything made me stronger. I had to be the rock for my little girl. I relied on God and did what I had to. Now I am not one to pop my own collar, but I provided a good life for my daughter. However, I do not take the credit because I know my Heavenly Father is the one who is responsible for my success. He gave me the strength that I needed then and is sustaining me now. I had a good pregnancy. I did everything that the good doctors told me to. I even began eating animal protein again. From my late teens up until that point I had been a strict vegetarian. I now know that vegetarian women have very healthy pregnancies. Meat is not a requirement. But I was extremely anemic during my pregnancy and I did not want to take any chances. I remember when I felt her move for the very first time. Butterfly flutters… It was at that point that I fell in love. The life inside of me was real. She would grow and become my baby. 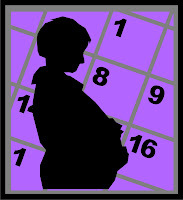 Doctor visits, sonograms, heartbeats and movements... A growing belly and increasing weight... These were signs of progress. Stronger kicks, an elbow to the side, oh and the ever filled bladder. I remember walking to the bathroom, returning to my bedroom, approaching the bed just to turn back around and begin the process over again. It seemed like a never ending water cycle. These were the signs that assured me of my approaching motherhood. But what about this adoption process? What signs of progress do we see? 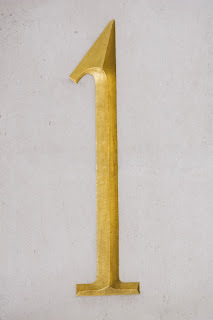 Of course there are milestones along the way, mini victories… a process one goes through until officially waiting. But how do you know when motherhood is approaching? There are no doctor visits, no sonograms, and no heartbeats growing stronger. When is the due date? No one knows for sure.